Context Chronic inflammatory vasculitis, namely Wegener's granulomatosis, is an autoimmune disease predominantly affecting the respiratory tract and rarely the mucosa of the upper or lower gastrointestinal tract. We report two cases of isolated pancreatic manifestation of Wegener’s granulomatosis, mimicking a tumor. Case Reports Two patients, a 57-year-old man and a 68-year-old woman, presented with isolated lesions thought to be pancreatic adenocarcinoma and both underwent surgical resection. On pathology, the lesions were found to be a granulomatous vasculitis and were considered to represent isolated pancreatic Wegener’s granulomatosis, in the absence of other clinical features of the disease. Conclusions Benign diseases such as Tuberculosis may mimic pancreatic tumours diagnosed on crosssectional imaging. 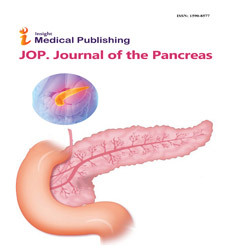 Wegener’s granulomatosis should be included in the differential diagnosis of an isolated pancreatic mass, in the absence of other cardinal symptoms for malignancy, due to the extensive surgery and risks involved in resection of pancreas.